Where is this retreat held? 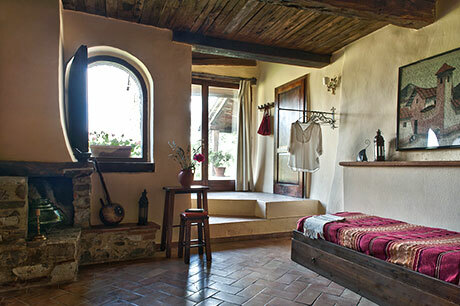 The retreat is in Tuscany at Le Pianore, an organic wine and olive oil producing agriturismo and villa surrounded hill towns and untouched natural rural Tuscan beauty. See more images at Le Pianore Gallery here. Pick up is in Siena on May 25 at 3pm in front of the Hotel NH Excelsior on Piazza la Lizzie which is on Via Tozzi – click here to see google maps of this area- (This hotel is a 10 minute walk from Piazza de Campo, the central plaza in Sienna). We will be holding a sign saying “Patricia”. From here we will travel 45 minutes to Le Pianore, a retreat center and organic vineyard and olive producing farm outside of Siena. For a link to Le Pianore click here. Departure from Le Pianore is on June 1 at 9:00am arriving at the Siena bus station at 10AM. Booking 3 – 6 months prior to departure usually offers the best fares. Flights into Rome are the least expensive and Rome to Sienna trains run regularly. Arrival – You can fly into Florence, Rome or Pisa. THE PICK UP AND DROP OFF IS ONLY AT THE HOTEL NH EXCELSIOR. PICK UP AT 3PM May 25. DROP OFF 10AM JUNE 1 AT THE HOTEL NH EXCELSIOR. Choose a flight schedule so that if your arrival is the day the retreat begins, you allow at least 1 hour to clear customs and to collect your bags plus transport time to Siena for pick up at 3PM so that the group can leave on time for Le Pianore. For departure choose a flight which allows 2 hours at the airport before departure, plus travel time from Siena bus station to the airport remembering that drop off in Siena is at 10AM. There is also train service from Rome and Pisa. The Italian rail system website is www.trenitalia.com. and the opportunity to enjoy the sensual delights of gourmet Italian cooking. There will be a maximum of 18 guests in single, double and triple rooms. Most rooms have private ensuite bathrooms. Is the retreat suitable for beginners? 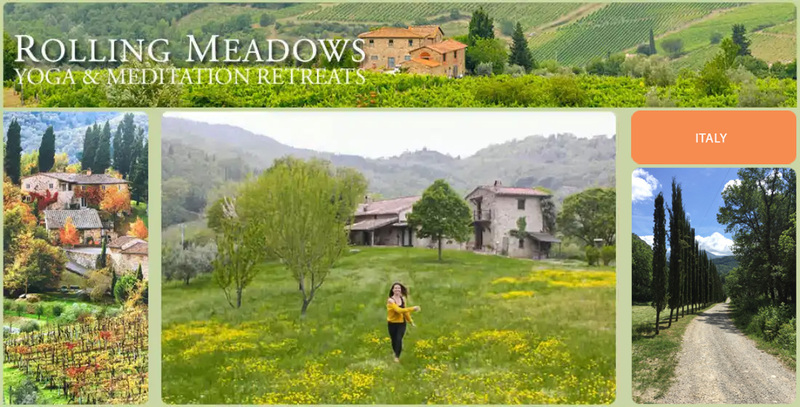 This retreat is suitable for anyone, regardless of age, physical ability or prior experience in yoga, meditation and breathwork. The teaching is primarily guiding each participant back to their own intuitive knowing. Will you find a roommate for me if I come by myself? Yes. Each spacious room has two twin beds or a queen size for couples. We have studied with many teachers in a variety of styles over the years – we offfer a fluid practice emphasizing inner listening and exploration, including Iyengar and the Viniyoga of Desikachar, fluid yogic movements of Continuum, as well as Vipassana meditation, non-dual teachings and breathwork. The teaching is a synthesis of all that we have studied for 36 years and what has evolved during years of practice. Go here for more about this. What are the retreats like? The Yoga Retreats are an opportunity for one to relax and rest in the natural presence/awareness that we are. We feel this is the essence of yoga, meditation, breathwork and retreat in general. The schedule, teaching and environment allow one to let go of the demands and details of daily life and to reconnect with and reveal their own deeper knowing. Yoga postures, breath awareness, breathwork, restorative postures, meditation, silence, and free time in the natural world generally assist in this letting go. As we let go of tension and the busy mind, a deeper knowing that is always present, reveals itself. There is ample opportunity for people to ask questions during the sessions or in private interviews between sessions. Yes. This is not included in the retreat fee and will be scheduled between sessions. I have heard of Yoga Vacations, but these are called Yoga Retreats. What is the difference? We have called these “retreats” because we consider them a unique opportunity to pull back and take a rest from our busy lives with the many distractions. Most people coming on these retreats have a sincere desire to explore and nourish their spiritual lives. There are no “rules” about how one should spend their time, but we encourage participants to use the time between sessions thoughtfully. Often traveling and sightseeing during a retreat is just another distraction and the actual reasons for coming on retreat are diminished. Are there any silent periods during the retreat and if so why? 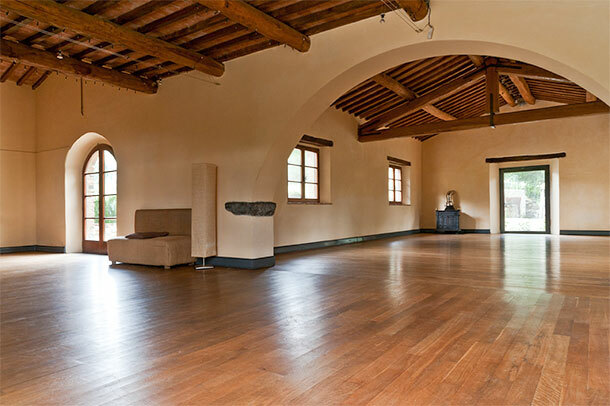 While the retreats in Maine are held entirely in “social silence“, the retreats in Italy have periods of silence. Each evening silence will be observed after the evening meditation until after breakfast the following morning. There will be additional periods of silence in the retreat. Anyone may choose to have as much “alone time” as they would like to extend the periods of silence. Most people today have busy lives and spend very little time in silence. Silence is restful, being the mirror of our natural state. Silent community creates a supportive environment in which to deepen understanding, awareness, openness and compassion. This greatly enhances the benefits of a yoga retreat. The practice of aligning with our true nature beyond the habitual patterns of conditioning. This process unfolds naturally during the retreat as practice and awareness deepens. Do we need to bring yoga mats or blankets? No. Le Pianore supplies all that is necessary. Are the any additional taxes we need to pay? To return to the first Italy page click here.